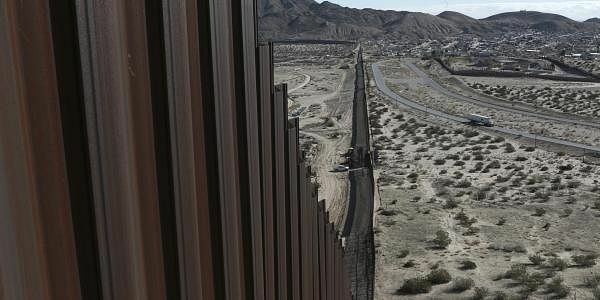 The government has not said where the wall will be built, though notices suggest a new wall could replace existing fencing that stretches about 700 miles of the roughly 2,000-mile border. WASHINGTON: The Trump administration wants to build a 30-foot-high border wall that looks good from the north side and is difficult to climb or cut through, according to a pair of contract notices posted to a government website further detailing President Donald Trump's promise to build a "big, beautiful wall" at the Mexican border. The notices were made public late on Friday by Customs and Border Protection, the Homeland Security Department agency that will oversee the project and eventually patrol and maintain the wall. The proposals are due to the government by March 29. One of the CBP contract requests calls for a solid concrete wall, while the other asks for proposals for a see-through structure. Both require the wall to be sunk at least six feet into the ground and include 25- and 50-foot automated gates for pedestrians and vehicles. The proposed wall must also be built in a such a way that it would take at least an hour to cut through it with a "sledgehammer, car jack, pick axe, chisel, battery operated impact tools, battery operated cutting tools, Oxy/acetylene torch or other similar hand-held tools." This is the second time the Trump administration has asked for private companies to bid on building the wall. Last month, CPB put out a call for "concept papers" to design and build prototypes by March 10. Trump has bragged in recent days that the wall is ahead of schedule, though it's unclear from the latest contract notices if any firms have submitted wall proposals or if any such submissions have been rejected. The government has not said where the wall will be built, though the contract notices suggest some pieces of a new wall could replace existing fencing that stretches over about 700 miles of the roughly 2,000-mile border. The current fencing of mixed construction, including 15-foot steel posts set inches apart that are designed to keep people from crossing and shorter posts that are intended to block cars. Border Patrol agents are constantly repairing holes in the structure. Trump has long promised that Mexico would pay for the wall, which he has said is necessary to stop the flow of immigrants crossing the border illegally and drug smugglers. This week the president sent a budget proposal to Congress that included a $2.6 billion down payment for the wall. The total cost for the project is unclear, but the Government Accountability Office estimates it would cost about $6.5 million a mile for fence to keep pedestrians from crossing the border and about $1.8 million a mile for a vehicle barrier. Congressional Republicans have said Trump's wall would cost between $12 billion and $15 billion and Trump has suggested $12 billion. An internal report prepared for Homeland Security Secretary John Kelly estimated the cost of building a wall along the entire U.S.-Mexico border at about $21 billion, according to a U.S. government official who is involved in border issues. The official spoke on condition of anonymity because the report has not been made public. That report proposed an initial phase that would extend fences 26 miles and a second wave that would add 151 miles, plus 272 "replacement" miles where fences are already installed, according to the official. Those two phases would cost $5 billion. It is unclear how soon Congress might act on that request or how much money lawmakers will ultimately approve for the wall. Democrats and some Republicans have said a border-long wall is unnecessary. The Department of Homeland Security reported earlier this month that the number of border arrests dropped about 44 percent from January to February, the lowest monthly tallies since at the least the start of the 2012 budget year.